CHELSEA: Manchester City regained top spot in the Premier League with a deserved 1-0 victory over an out-of-sorts Chelsea at Stamford Bridge yesterday. Having been knocked down into second place by Manchester United’s win over Crystal Palace earlier in the day, Pep Guardiola’s side jumped back ahead of their city rivals on goal difference thanks to Kevin De Bruyne’s superb second-half strike. City are now unbeaten in 15 league games and have dropped only two points this season. Chelsea sustained their second defeat of the campaign at Stamford Bridge and fall to fourth, six points adrift of the two Manchester clubs and one behind Tottenham Hotspur, who are third. Their poor performance and result were compounded by losing top scorer Alvaro Morata to injury in the first half when he limped off, holding his hamstring. Chelsea started quickly and had an excellent opportunity to take the lead inside three minutes when N’Golo Kante crossed from the right for Morata but the Spaniard’s recent lethal form in front of goal deserted him and he could only loop his header from six metres over. The hosts then almost gifted City a goal when Thibaut Courtois dithered over a clearance and saw his kick ricochet off the charging Gabriel Jesus and bounce just wide. 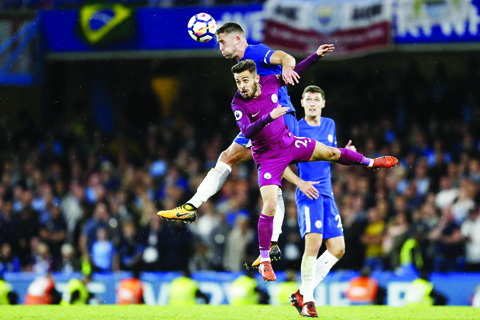 Cesar Azpilicueta had a left-foot shot turned around the post by Ederson and David Silva had a strike palmed clear by Courtois as the two sides fought out an evenly matched contest. City, though, began to take control of both territory and possession after the half-hour mark and both Nicolas Otamendi and Fernandinho missed headers from corner as the visitors pushed for an opener. Matters worsened for Chelsea when Morata was forced off 10 minutes before the break. City continued to press in the second half and Raheem Sterling should have done better than half-volley over when he received the ball unmarked on the edge of the box from a corner. Sterling turned provider in the 66th minute when he cut back to the unmarked Silva on the penalty spot, but the Spaniard took too long and his right-foot shot was blocked. It did not matter as City took the lead a minute later when De Bruyne played a one-two with Jesus and rifled a sublime left-foot shot into Courtois’s left-hand corner for his first Premier League goal of the season.